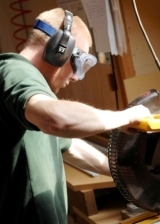 According to the latest statistics from HSE (2008-2009 – Provisional) the major accident rate for woodworking is more than 17% above the manufacturing industry average. Like most industries, handling and slips and trips account for most injuries. However, by nature of the type of work, woodworking has a number of accidents caused by contact with moving machinery. The human cost of injury is immediate and distressing, and a responsible employer’s first duty is to ensure that its employees can work safely. But beyond this, the impact on the business is considerable. HSE has calculated that for a serious or major injury, the typical cost to employers is about £17,000 to £19,000. Fee for intervention, introduced by the HSE in 2012 mean that costs can stack up even if an accident never happens. If your workplace is in ‘material breach’ of health and safety laws, you are liable for recovery of the HSE’s costs for any inspection, investigation and enforcement action that is undertaken. HSE’s costs are set at £129/hour. For businesses that end up in court, the Sentencing Council has now published definitive guidelines for sentences relating to health and safety offences and corporate manslaughter. These consider the risk of harm caused, as well as offender culpability, meaning that company directors found to have been consenting or neglectful in relation to a Health & Safety offence could face potentially unlimited fines and prison sentences of up to two years. A lower threshold for imprisonment could also lead to more directors, managers and junior employees being handed custodial sentences. The guidelines require the court to take into account the size of the organisation when determining the sentence, with company turnover used to determine the starting point of the fine. The increased levels of fine will hit businesses of all sizes – those with a turnover of more than £50 million which could face fines of up to £10 million for health and safety offences and £20 million for corporate manslaughter. The Health and Safety at Work Act etc. 1974 (HSWA) applies to all work activities and lays down very general duties on various parties in respect of Health and Safety. HSWA includes the phrase ‘so far as reasonably practicable’, this means you must balance up the risks to health and safety against the time money and effort it will take to reduce the risk. Certain risks will need to be addressed whatever the cost; in other situations the level of risk will determine the action that you should take. HSWA requires all employers with 5 or more employees to have a written health and safety policy statement. If you have less than 5 employees you are not exempt from having a policy it just does not have to be in writing although you may wish to consider developing a policy statement to set out your intentions regarding health and safety. The BWF Code of Conduct however requires that members have such a statement no matter what size of company. You may find your clients requesting a copy your health and safety policy when tendering for work; it is good practice to have a policy and a signed statement can demonstrate your commitment to health and safety. It is mandatory for BWF Members to actively comply with current legislation and this forms a vital part of our Code of Conduct audits. As well as a range of useful fact sheets, regular accident alerts and our popular woodworking machinery safety cards, BWF has produced a comprehensive but practical 91 page Health and Safety Manual targeted specifically at Woodworking and Joinery companies. which can be downloaded free by Members. We work closely with the HSE and leading practitioners in the sector and lobbies to ensure that legislation is proportionate. Look out for our ‘BWF Health & Safety Hero’ campaign to achieve zero tolerance in respect of fatal injuries, RIDDOR related incidents and occupational ill health incidents in the woodworking industry.